Delta's PIONEER® forced draft cooling tower line is factory assembled in single modules from 10 through 100 tons of cooling capacity. 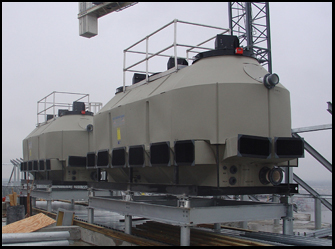 Delta's PARAGON® induced draft cooling towers are factory assembled in single modules, from 100 to 250 tons in single modules. 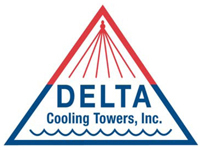 Delta's PREMIER™ induced draft cooling towers are offered in 6 single-cell models ranging from 250-500 cooling tons, and features a low profile de-sign. They are designed for ease of installation to span existing cooling tower structural supports. The Premier™ towers come standard pre-mounted on a steel platform. 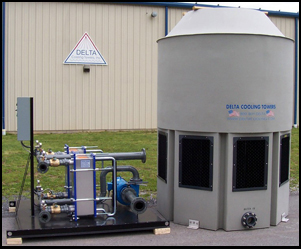 Delta's TM Series™ cooling towers are supplied from 250 up to 2000-ton capacity in multi-module systems, and are CTI certified. They are a double wall polyethylene construction designed in two sections for shipment purposes. The tower section includes the wet decking, the hot water distribution system, the mist eliminator and the motor/fan assemblies with the velocity recovery fan stacks. The other section is the cold-water basin. Corrosion Proof - Fabricated of corrosion proof engineered Plastic that will never rust, flake, chip, peel or ever need painting or pro-tective coatings applied. Seamless - The tower shell is rotationally modeled of polyethylene plastic-the only large packaged towers in the industry to have a "one piece" shell. Light Weight - 30% to 50% lighter in weight than steel towers-beneficial on roof installations, light weight raised platforms-lower rigging/placement cost.